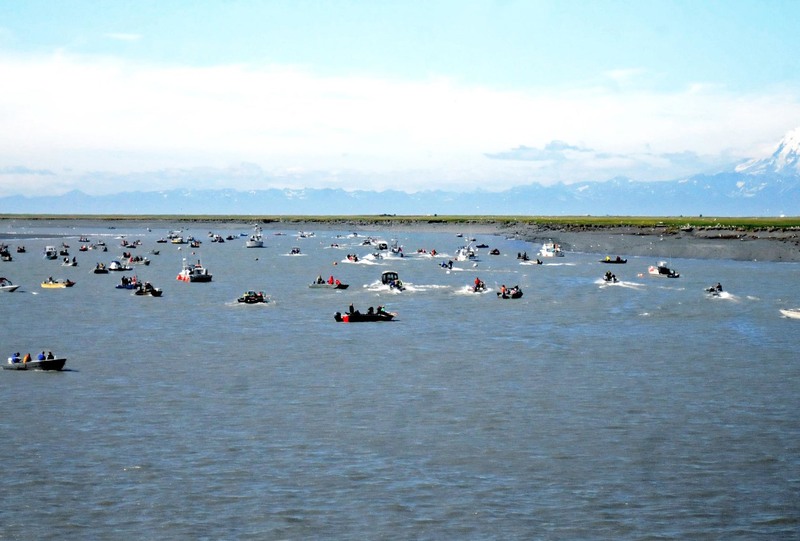 KENAI — Like most fisheries issues in Upper Cook Inlet, there’s a lot of disagreement about what to do with the Kenai River personal-use dipnet fishery. The fishery, which takes place every July 10–31, is the most popular of its kind in the state. Thousands of Alaskans jump into boats and flock to the Kenai River’s north and south beaches to get a shot at the sockeye salmon that return to the river every year, harvesting some 259,057 sockeye in 2016, according to the Alaska Department of Fish and Game. However, the push and pull of allocation battles, safety issues and habitat damage may herald some changes for the fishery in the upcoming Upper Cook Inlet Board of Fisheries meeting. Some proposals ask the board to set more limits on the fishery. Others ask for liberalization of time and space. The board will take up and discuss all the proposals at its meeting in Anchorage from Feb. 23-March 8. Two proposals ask for the dipnet fishery to be extended into August — one from a private citizen and the other from the sportfishing, trapping and hunting advocacy group the Alaska Outdoor Council. The citizen, Ronald Jordan, wrote that the dipnet fishery would be safer if it were extended to the second Sunday in August; the Alaska Outdoor Council wrote that extending the fishery through Aug. 10 when the sonar estimate is projected to pass 1.2 million sockeye would allow more opportunity for anglers and dipnetters. Rep. Les Gara, D-Anchorage, lent his support to extending the season with a letter to the Board of Fisheries, dated Feb. 2. He urged people to send comments to the Board of Fisheries about dipnet timing issues before the meeting in February. His comments make the argument that because sockeye salmon are arriving later and the commercial fleet is allowed by regulation to fish until Aug. 15, the dipnetters are unfairly shorted a shot at the sockeye. It should still be executed to protect silver salmon runs, though, which intersect with the tail end of the sockeye runs, he wrote. Extending the dipnet fishery would also impact the City of Kenai, as it is responsible for cleaning and patrolling the beaches and the section of the river between the Warren Ames Bridge and the mouth. In comments on the Alaska Outdoor Council’s proposal, City Manager Paul Ostrander wrote that the city opposes the proposal because reopening the fishery would require the city to re-establish some of the amenities and services supporting it, which would be expensive. “Additionally, it is likely that participation during the first 10 days of August would be lower, resulting in lower revenues to the City from participant fees without a commensurate reduction in costs,” he wrote. Gara wrote in his letter to the Board of Fisheries that should the proposal pass, it should include proper notification to the city. Four proposals ask for changes to the boundaries of the Kenai River dipnet fishery. Three would expand or change the boundaries, and one would cut back on shore access. Fish and Game submitted a proposal to close the banks of the river between No Name Creek and the Warren Ames Bridge to shore-based dipnetting because of habitat damage. If the board adopts the proposal as it’s written, dipnetters would only be able to fish from a boat unless they were on the north and south beaches of the Kenai River’s mouth, both of which have entry fees administered by the City of Kenai. Included in the closure would be a number of private homes along the riverbank just downstream of the bridge. Those property owners would no longer be able to fish from their own property under the closure, Ostrander wrote in the city’s comments. Instead, the city proposed the closure only stretch between the bridge and a line just upstream of the first property. “If the city’s proposed amendment is adopted, (the proposal) will still accomplish its primary objectives of protecting the sensitive vegetated tide land area on the north and south shores of the river in the area immediately below Warren Ames bridge and eliminating overcrowding issues at the Kenai Flats Day Use Area,” he wrote. The city was less amenable to a proposal from the Kenai River Sportfishing Association to extend the dipnet fishery from boats up to Cunningham Park, about another 1.5 miles up the river. Extending the fishery would help reduce crowding for dipnetting boats elsewhere, the proposal states. The City of Kenai “strongly opposes” the proposal, according to its comments. It would increase impacts to property owners in the area, including boat wake, noise and trespassing, and could create crowding and facility capacity issues at Cunningham Park, which is currently a popular bank angling spot. The city would be have to institute fees there to cover the additional costs, Ostrander wrote.